If you need to deal with creating images by capturing screen for your day to day work or anything else, then Snagit is a essential softwareÂ which is needed for creating some great images for your work. Thanks to Techsmith, we are giving away few licenses of Snagit to Avinashtech Readers. More than just simple screen capture, Snagit empowers you to communicate faster, clearly explain concepts, and archive digital information. All with point and click convenience. You can easily capture, edit, share and organize a screenshot of exactly what you see on your screen. Snag anything, on the fly. Grab your entire desktop, a region, a window, or a scrolling windowâ€”all with a single hotkey or click. Add effects to your image, even if you don’t have a design degree. Draw attention with arrows, add a text callout or torn edge effectâ€¦just to name a few. * Save it in your preferred format. * Share a URL or embed it in your blog via Screencast.com. * Add it to your Microsoft Word, PowerPoint, MindManager or OneNote page. * Publish to your website via FTP. * Send it through email, AIM, Flickr or Skype. I use Snagit for my day to day Blogging work and its a learning experience for me often. I will often find something new which is possible with Snagit and I never thought about it. Its a complete screen capturing software with good enough built in Editing tools to give you great flexibility to manage your captured images. You can do almost everything with Snagit starting from capturing Image whether its a web-page, big or small, or you need to scroll or a part of screen, or full screen or a part of menu orÂ apart of menu coming after a click, watermarking it, resizing it, scaling it, blurring it and much much more. I have not used any other tool after I started using Snagit and I use it almost everyday. (Thanks to complimentary license provided by Techsmith). You can also use Snagit toÂ create time lapse video of your Desktop activity over a period of time (Frankly speaking I knew this just now while testing it). Give Snagit it a try. Leave a comment below telling why you would like to have Snagit License. Keep in mind, Multiple entries will disqualify you from the draw. It closes in next 72 hours. Looks like you forgot to enter your name in giveaway. (The 2nd in the list of rules above). I’d like to win a license, because that is the most comprehensive to make screenshots with various options and also because-I know uses it. SnagIt is very cool: I’m using ver 7 right now and I would a license for the new version. Thanks for the giveaway and HappY BirthdaY!! I’m still using 7.2.5 version on W7!!! Happy birthday Avinash forum, I am using solid capture. I see “Combine images” function in snagit which don’t appear in solid capture. Hi, I would like to have Snagit as I’ve used the demo version and found it extremely easy in capturing different screens with varying sizes. Its many functions allowed mt to take screen shoots quickly for my projects. Thanks, Avinash. I also have been using PicPic, and it would be great to “upgrade” to Snagit. Please count me in. Best regards. I had SnagIt 8 before & found that it’s full features captures were good. Hopefully can win 1 license to have SnagIt again. I would love to try out Snagit.. currently have Solid Capture and Snap to use until can get something better.. I use the program to take snap shots from the Web to post on the forums for giveaways and tutorials and to help others when they have questions… Would love a shot at winning this..
Snagit is useful for capturing screenshots for presentation projects. Please count me in. Thanks a lot. 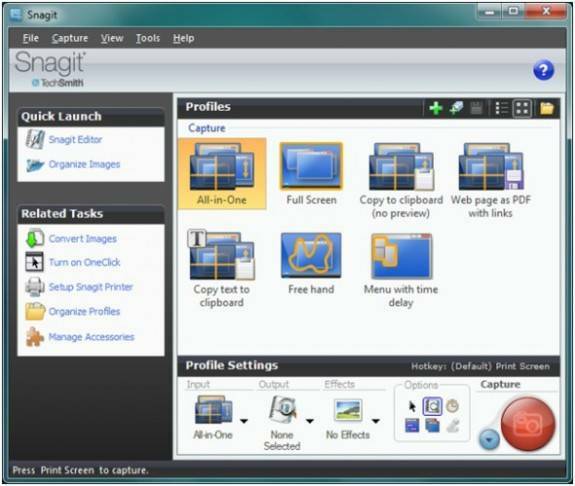 Thank you Avinash,I am using the free Screenshot Captor and Gadwin Printscreen for taking screenshots.I would like yo have a license of Snagit for my windows system because of its capability of taking neat and professional looking screenshots and also it has more functionality compared to other tools. with it’s high reputation as one of the best capture tool , this really a great offer, wish i’ll win one license, great offer, thanks alot….. I think that it is the best screen grabber. I need it for my schoolwork. Thanks for this giveaway.Snagit is the best screen capture utility and as a student i need it very much for personal use.Hope i win a free license for that. Snagit… really good software..I would like have a license of Snagit because it has ability to edit the capture, web capture as PDF and it has more functionality to other tools. I really like this superb screenshot taker,Thanks.This is the best one and takes screenshots brilliantly. This product will help me be more descriptive in e-mails to friends when describing items on web sites. A program I don’t have that a would really like to have. SnagIt can be considered as the best screen capture software. I used SnagIt trial when it was in version 8 and it impressed me a lot. If I can have the latest full version, that certainly will be great. Please count me in, Avinash! I use cracked version of snagit, Will love to have it. The best part is the screen capture. It’s so easy. Hope to win Snagit because i really could use it for screen capturing of webinars that I frequently attend so I won’t miss out on any notes/details. SnagIt is one of the best screen capture software and editing tool. Thanks for this great giveaway please enter me in the draw for Snagit. Snagit would do nicely for when I collect snippets of information here, there and everywhere! So please count me in, thank you. Thanks for the giveaway. I had used an older version of Snagit and found it full of features and Â user friendly. Please count me also. Looks like just the app I can use to capture images of my new grand daughter during our online video chats. A very neat way to capture only the parts wanted from web pages and emails. Please include me in the draw for Snagit.